Seeds used for sprouting is sanitized by immersing it briefly in hot water prior sprouting. This process prevents human and plant pathogens from being carried over to the growing process where they can spread easily in the warm and humid environment. ・In order to use heat as a disinfectant successfully, the temperature and contact time of the seed with hot water need to be controlled very accurately. In addition, each seed needs to be treated exactly the same, otherwise the germination ability is reduced or pathogens may escape the treatment. ・Using the latest available technology, all of our models are assuring a constant contact temperature & time. ・The seed is sanitized without the use of chemicals harmful to the operators of the sprouting plant and the environment. ・Heat is a natural and very effective disinfectant ? making the process suitable for organic producers. ・Automatic and semi-automatic models are making the labor-intensive processes of seed treatment much simpler. Beside operating costs for the steam boiler and machine, there are no additional expenses (such as for expensive chemicals). ・The method has been used in sprouting operations of all sizes in Japan for over than ten years . ・Tests in our Lab as well as in sprouting operations in Japan and in the USA have shown that “Seed Disinfecting” is - comparwith other meteds - the most effective method to sanitize sprouting seed successfully under the operating conditions of a sprouting plant. Several models are available depending on the sprout produced and the daily capacity. Our range includes fully automatic systems with a capacity of over 13’000lb of seed per hour (for mung beans) as well as semi-automatic systems for smaller operations with a capacity starting from 200 lb of seed per hour. 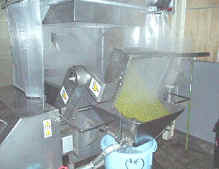 The “Seed Disinfecting Method” can be used to sanitize Mung Beans and other seed used for sprouting such as Alfalfa. We have pioneered the research in Seed Disinfecting and participated in the research to find effective solutions to disinfect seeds used for sprouting. We have shared our results and information with the USDA and the FDA and other organizations involved. *All information and specifications presented are subject to change without prior notice. Would you like some more information about this or any other of our products? Or do you have a tailor made solution in mind? Just contact us by e-mail for more information..